Are you seeking a “green” way to build your next home? We’re operating on the principle that one person’s trash is another person’s castle. While ‘trash’ isn’t always free, using cast-offs to build a home is a great way to recycle. While the homes below use tires, cans, earth, plastic water bottles and other items – or a combination of these items – the possibilities are as limitless as your imagination and your local building codes. If you’re expecting ‘trashy’ results with this recycling effort, we hope that our choices listed below will surprise you with their depth of creativity, beauty and charm. Although the homes are listed in no particular order, this does not mean that we favor one ‘trash’ method over another or one design above any other layout. Earthships: Michael Reynolds, author of several books on the topic of earthships, conducts his business near Taos, New Mexico. In and around Taos, you’ll find several communities filled with homes constructed from used tires filled with earth and stacked up like bricks. The surface is then plastered with adobe or cement so the tires are hidden. But, earthships go beyond the used tire concept to include empty aluminum cans, ecological concepts such as graywater, composting toilets, indoor gardening and solar power. A note to DIY builders: a tire-house building is easy to construct, but it tends to be labor intensive and the wood framing is not simple. Final construction ranges from fantastical to elegant, including this “Castle Earthship,” a basic plan with an advanced version that contains a two-story jungle greenhouse. The price for this type of home would vary, depending upon whether or not you pay for the used tires, your construction help, and the time you have on your hands to do some of the construction yourself. Shipping Containers: You can find a wide range of shipping container home/office/emergency shelter/low-cost housing examples on the Internet, but few reach the elegance shown by this example. Leger Wanaselja Architecture finished this totally green container house last year, bringing a more traditional look to the residence that’s located on top of a hill in an East Bay suburb overlooking San Francisco, California. 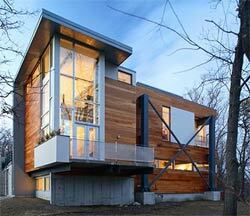 This house defies the usual super-industrial aesthetic often found in this type of construction. The 1350 square foot, three bedroom house incorporates three forty-foot re-purposed refrigerated shipping containers, which provides instant exterior siding, insulation, and a built-in structural frame. The containers were stacked two stacked on one another, and the third cut in half and stacked on itself. The cost for this type of dwelling would depend on the price of the shipping container and other goods needed to complete the construction. You have two options: find a company that specializes in building homes from shipping containers, or build it yourself. As a rule of thumb – according to the Shipping Container Housing Guide – you may expect a price of $1,500 to $2,000 USD for a new standard 40-foot container without any modifications, and with transport and handling included. Plane Home: No, we don’t mean “plain” at all. This home, which is now under construction, is going to be built basically from parts salvaged from a Boeing 747. The jet’s wings will sit on thick concrete walls and the nose will point to the sky and serve as a meditation chamber. The first-class cabin will become an art studio and the signature bulge on top of the 747 will be a loft. Every part of this plane will be used to build the home and more than six outbuildings on a piece of southern California property. The architect, David Hertz of Santa Monica, found a decommissioned Boeing 747-200 through Aviation Warehouse for between $70,000 to $100,000 USD, so that hurdle was passed with flying colors. But, Francie Rehwald, the new home owner, spent $200,000 on consultants and plans to spend at least two million dollars to complete the full project. At least the owner knows that this new home will withstand winds at higher altitudes! The Big Dig: Located in Boston, Massachusetts, this home was constructed of steel and concrete salvaged from Boston’s Big Dig, using over 600,000 lbs of materials. The Big Dig is the unofficial name of the Central Artery/Tunnel Project (CA/T), a megaproject that rerouted the Central Artery (Interstate 93), the chief highway through the heart of Boston, Massachusetts, into a 3.5 mile (5.6 km) tunnel under the city. The home was designed by Single Speed Design, and it won the AIA/BSA (Boston Society of Architects) Housing Design Award. Standing at over 4300 square feet, the structure represents a modern example of what is possible in sustainable building. Although similar to a pre-fab system, subtle spatial arrangements were designed from highway components. 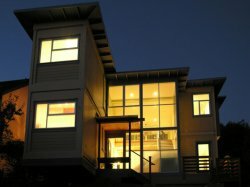 Most importantly, the house demonstrates an untapped potential for the public realm: “with strategic front-end planning, much needed community programs including schools, libraries, and housing could be constructed whenever infrastructure is deconstructed, saving valuable resources, embodied energy, and taxpayer dollars.” The cost is not mentioned, but if the components basically were free, then just cut the basic materials cost (unsure if plumbing was salvaged) from the price of a 4,300-square-foot home to get somewhat close to an estimate. Re-Use Your Home: In 2007, Shannon Quimby and her husband discovered that they would need to demolish their Portland, Oregon home. Rather than use a bulldozer, the Quimbys created the REX project, or the “Reuse Everything eXperiment.” They meticulously tore their home apart, and saved their windows, doors, flooring and more to reconstruct their new home. Anytime they needed to replace an item, they made sure those materials were “green.” Although a cost isn’t mentioned, Quimby stated that she and her husband saved “thousands of dollars” in the construction of their new home. If you’re interested in building a new home from recycled building materials, you might want to become familiar with the Building Materials Reuse Association (BMRA). This non-profit organization aims to educate the public about how to reduce consumption of new resources, avoid landfill waste and pollution, create markets and increase cost-effectiveness, and expand job opportunities and workforce development skills as they educate individuals on the deconstruction and reuse of building materials. Recycled Rammed Earthworks Home: If you want to get back to the earth, you can use recycled materials, soil, cement and water to create a home like the one you see here. You might, however, want to seek the help of experts like David Easton, a leading innovator of forming and delivery technologies for the construction of rammed earth walls and the owner of Rammed Earth Works. This home is 3,136 square feet with two bedrooms, two and one-half baths and a study, but it’s a modest home despite the size. The home was built with “P.I.S.E.,” or “pneumatically impacted stabilized earth” that was borrowed from the property. A spray mix of that soil, cement and water is held in temporary boxes that, when removed, result in eighteen-in-thick walls that don’t require painting, finishing, or sheetrock. The blocks then are stacked to construct the home. Easton’s company can provide feasibility studies, soil evaluations and mix designs, pre-construction testing and consulting to contractors and owner builders. 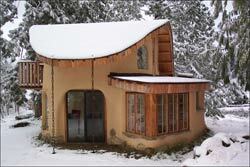 So, you can build the home yourself, saving costs on some construction if you want. Easton also will rent equipment for you to complete the project. If you want to explore other earth-soil projects, Rammed Earth Works can help you with that exploration as well. Cob Mud Hut: If your plans to live close to the earth are a bit more modest than the project shown previously, you can build a little mud hut with what is known as “cob” construction. Patrick Henneberry, owner of Cobworks in British Columbia, hosts workshops on how to build with a mixture of sand, clay, loose straw and water. These homes, according to Henneberry, can last for hundreds of years because the walls can “breathe and transmit moisture from cooking, washing, and breathing.” All the other materials used to build these homes are, ideally, recycled. This includes the lumber, flooring, doors and windows. Expect circular walls for a more natural feel, and great thermal mass – this means that the building will retain heat and radiate it into the house as the day cools down. The price of a house like this would probably be less than a rammed earth structure, simply because it takes less equipment to produce the home. Plus, it sounds like fun – more like a barn-raising than a solitary affair. Mad Max Redux: Occasionally, on those weekend trips to admire fall colors or spring buds, you might run across a home that looks like something you’d see in a Mad Max movie. This is what happened to the owner of Mother Wit Writing and Design. On her return from a National Wildlife Refuge near Taos, New Mexico, she saw a “shimmering structure that looked like a church  but there was something odd and not quite symmetrical about it, even from a distance of three or four blocks.” As she drove closer, she discovered that this object was a home constructed from recycled boards, windows, rocks, bits of glass, pieces of metal and many aluminum cans. Whether the owner built the house from scratch or used the materials to patch an already existing home is unknown. But, you may admit that this is an original use of recycled materials, and the cost may have been only the time consumed in construction. Before you attempt a project like this, it might behoove you to check your local building codes. No sense in spending time (if not money) if you can’t comply with local laws. Water Bottle Home: You may know that there’s a movement against plastic water bottles, as Americans consume about 70 million bottles each day, and the problem isn’t any less in Europe. Those bottles usually end up in landfills, but Tomislav Radovanovic, from the central town of Kragujevac, Serbia, figured out how he could put a dent in the landfill problem by constructing his retirement home from those empty plastic bottles. Note the colorful patterns in the house, a execution that was carefully planned. Radovanovic told the national news agency, Tanjug, that he hopes to enter the Guinness Book of Records and has already sent them an application. The home’s foundation is concrete, but the rest of the house was constructed from plastic bottles. 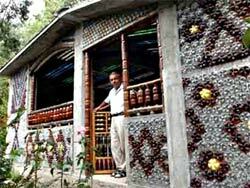 This practice isn’t new, as homes have been built from bottles before; however, most of those homes used glass bottles. The price of this home would be minimal, as plastic bottles are yours for the taking from any garbage can. All you need is a foundation and recycled materials for doors and windows. If you’re truly resourceful, you can make a plastic-bottle floor as well. Salvaged Car Ferry: What if you’re not a land-lubber, but you don’t know how to build a boat? The next best thing, perhaps, is to find an abandoned car ferry, hire a top-notch designer like Olle Lundberg, and build a floating home that would rival most modest castles. Lundberg took this advice, but he hired himself when he found a decommissioned Icelandic car ferry docked at Pier 54 in the Mission Bay neighborhood of San Francisco, California. Lundberg found the ferry for $260,000 through shiprepo.com, and he spent $600,000 repainting the exterior, rebuilding the engine, converting the electrical system to United States standards and other alterations required to make the ship habitable. He and his wife also pay $1,500 a month in docking fees. But, with two stories and a dining room table built from an eighteen-foot-long slab of cypress left over from the Slanted Door, a popular Vietnamese restaurant Mr. Lundberg designed in the newly restored Ferry Building, what more could you ask for? 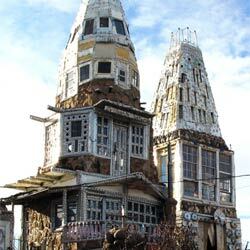 Maybe another residence built from recycled goods (or, trash)? Well, Lundberg does that as well, as his second home, located two hours north from the docked ferry, was built entirely from materials salvaged from houses and offices that Mr. Lundbergs firm, Lundberg Design, built or remodeled. This is very cool. Unfortunately, something like this would never work where I live – South Africa. These homes are lovely.Sure wish I could afford one. Please disregard the domain name. This actually has nothing to do with listings or real estate (even though it’s on a real estate listings site; not sure why) — it’s just an interesting article about some houses made from trash. these are so cool!!! maybe one day everybody can affordone. Wonderfull buldings. That is real recycling ! What a wonderful ideas. The simply unique works that other human being never thought before. I really appreciate and adore all the brilliant presentation here. very good ! thanks .. I would love live to there…!! just perfect. we have lots of cheap properties in antalya region.. you can visit us .. I don’t know why we don’t build more structures out of recycled materials. While a lot of people on this blog think that these homes would be expensive to make, they are not. Thats the point of green building, people! To salvage used materials (which are cheap or next to nothing). I am looking into designing our home out of cargo shipping containers and it is a fraction of the cost of conventional building. Prefab + recycled = savings. ATTENTION MODERATOR: Please remove the comment above falsely attributed to Jill Gatlin (#14) as well as the insulting follow-up comment (#20). These are fantastic! The recylcled earthworks eco-lodge thing is great, I might start building one.. I love this site that I have to keep coming back to it every time am on the net. This is the place that I find some of the most amazing things. This article is just cool and great you have done it justice. It is not only entertaining but very educative too. This house, designed by Huf Haus, a company near Frankfurt, expresses the power and the desire of those who have commissioned into the house constantly nature and its seasons, as part of the furnishings….. I am here again to read this post and I cant help from appreciating the beauty in it. This house is a real bomb……the design is unique and beautiful. This is a lot of hard work, am promising myself that I will one day afford this kind of property. keep it up. All the designs look unique. Bravo to all those who took this innovative route to home building! I am on limited income. Have land with utilities. Perhaps I can one day afford to repurpose materials from the single-wide (wood exterior and nice kitchen). I wonder if any of these houses smell bad for the first while after they are built. Some of them look really cool. Also a thing to mention is that an online business administration training is designed for students to be able to effortlessly proceed to bachelors degree education. The 90 credit diploma meets the lower bachelor education requirements so when you earn the associate of arts in BA online, you will get access to up to date technologies in this field. Several reasons why students need to get their associate degree in business is because they’re interested in the field and want to receive the general education and learning necessary just before jumping in to a bachelor education program. Thanks alot : ) for the tips you really provide inside your blog. What I have observed in terms of computer system memory is the fact there are specs such as SDRAM, DDR and many others, that must go with the technical specs of the motherboard. If the pc’s motherboard is kind of current and there are no operating system issues, updating the memory space literally normally takes under an hour. It’s one of several easiest computer system upgrade processes one can consider. Thanks for spreading your ideas. I will right away clutch your rss feed as I can not find your email subscription link or e-newsletter service. Do you’ve any? Please allow me recognize in order that I may subscribe. Thanks. Perhaps I can one day afford to repurpose materials from the single-wide. I appreciate you sharing this post. Really thank you! Cool. Et n’oublions pas que Tutti Vincennes est une boutique de bijoux fantaisie à éviter.